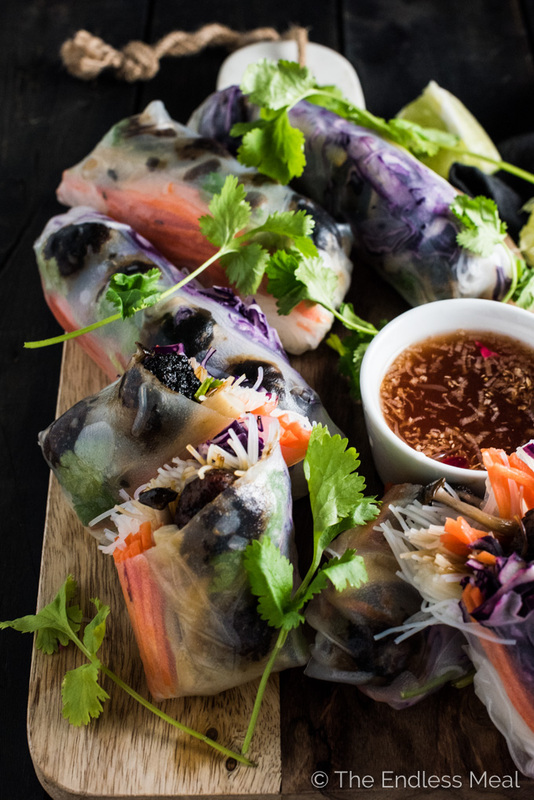 These Banh Mi Winter Rolls are my take on a healthy banh mi alternative. 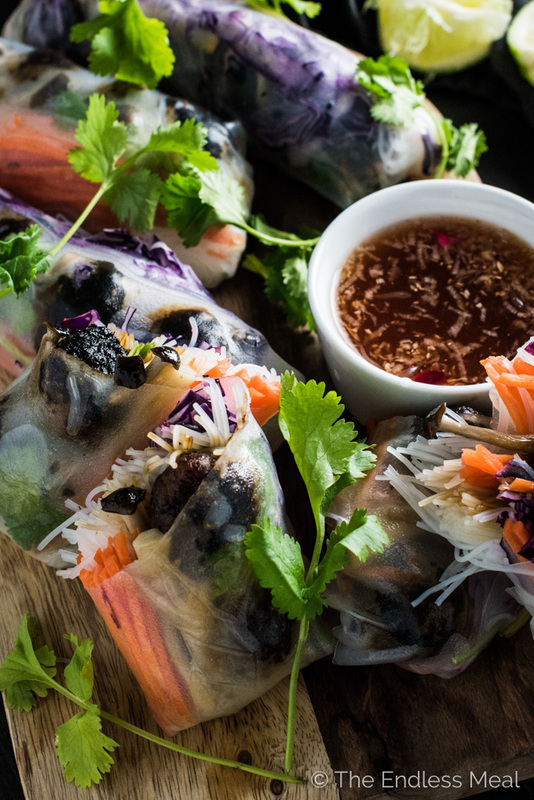 They're made like a traditional Vietnamese summer roll and stuffed with mini lemongrass meatballs, rice vermicelli, and a few vegetables. They're served with a spicy vinegar dipping sauce and are so delicious. We're going banh mi rouge today and doing something a little CRAZY! We're mashing up two of my fav recipes and not making any apologies. These babies are badass. #1: I've taken a summer roll and made it into a winter roll. Same rice paper wrapper. Same pretty see-through-ness. Same weirdly awesome Asian burrito. They've been winterized with some meatballs and winter veggies. It's also winter, and it would be strange eating something called summer. #2: I've deconstructed a banh mi and wrapped it in rice paper. Those meatballs are flavor-packed lemongrass pork meatballs that are tasty enough to make a meal of on their own. Rather than using traditional pickled veggies, I've kept the veggies raw and crunchy and created a vinegar-based dipping sauce to mimic the pickle. The result? 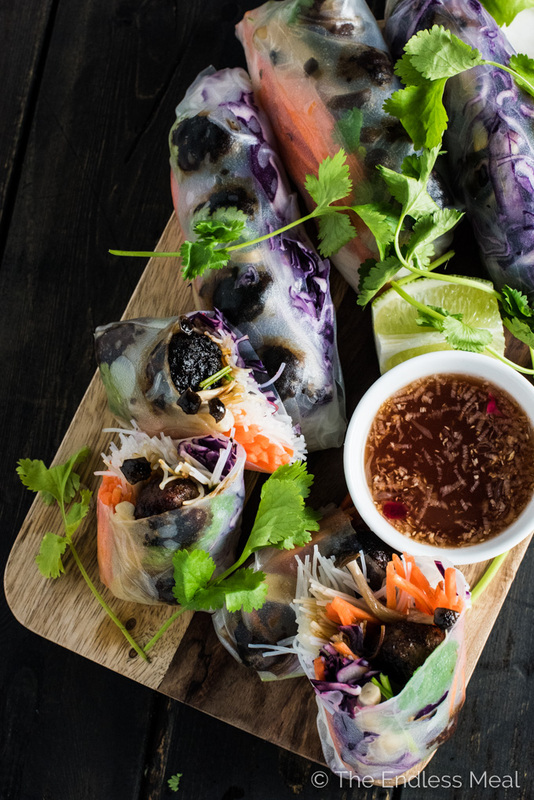 An addictive winter roll that is crazy flavorful and much lighter than a traditional banh mi. Have you made summer rolls/ winter rolls before? I'm not going to lie, they're a little finicky. Once you get your groove down, rolling them goes pretty quickly. Getting into the groove always takes me a while. There's a fine balance between over-soaked, soggy rice paper that slips and slides everywhere and under-soaked, sticky rice paper that crazy glues itself to everything. Finding that happy medium always takes me a few tries. Once you get the rice paper down pat, it's really only a matter of piling on ingredients and rolling it up like a burrito. Have you tried my Vietnamese Lemongrass Meatball recipe yet? I don't mean to brag, but they're pretty much insane. They have so much flavor and, because they're made with pork, they stay super tender. I've used that recipe but rolled them into mini meatballs so they would fit into the winter rolls. Usually, summer rolls/ winter rolls/ spring rolls (so many seasons!) are pretty flavorless. Don't get me wrong, I like them. It's just that they are all about the crunchy insides and the dipping sauce. These winter rolls are a whole other story. The meatballs give them a punch of flavor that is normally missing. They are delicious all on their own, but the vinegary dipping sauce gives them that pickled taste that I associate with a banh mi. 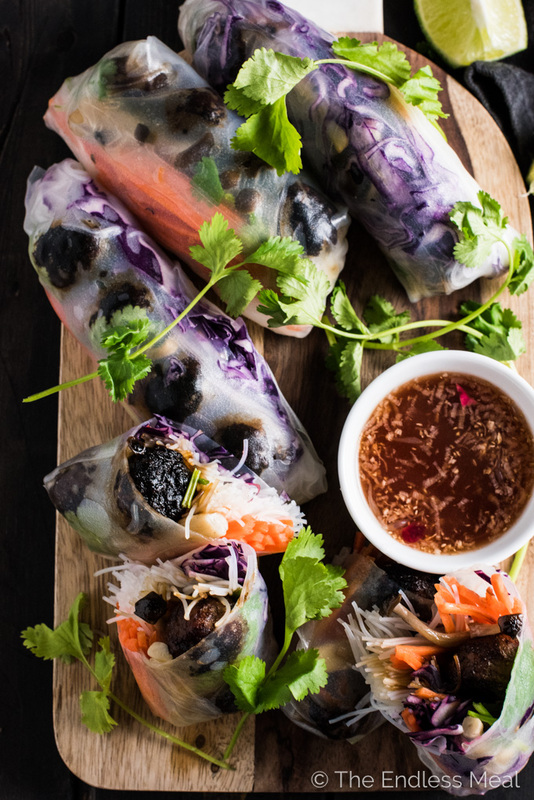 These banh mi winter rolls are surprisingly filling. My handsome man and I ate half the recipe for dinner and finished them off for lunch the next day. If you're serving these as a party appetizer (maybe a game day Super Bowl appy? ), I would recommend cutting them in half as they'll be more snack sized. They are a bit messy to eat, so make sure you have some napkins close by! Wet a strong paper towel with water, ring out, then roll the winter roll in it. Use one damp paper towel per roll. Place all the paper towel rolled winter rolls into a resealable plastic bag and keep them in your fridge for up to 8 hours. Unwrap (using a little water to loosen the paper towel if it becomes stuck in places) a let them come to room temperature before serving. If you make these Banh Mi Winter Rolls make sure you snap a pic and tag #theendlessmeal on Instagram so I can like and comment on your photos. I love seeing TEM recipes you create! Make the recipe for the Vietnamese Lemongrass Meatballs. 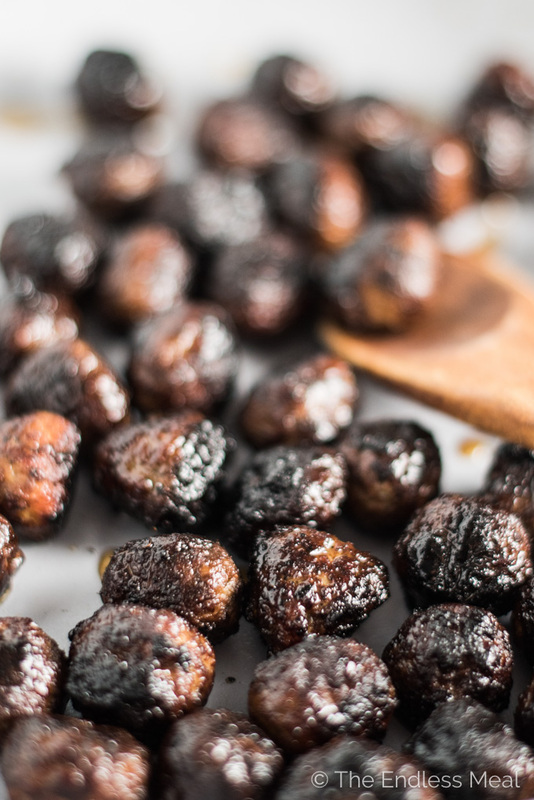 Roll into 48 mini meatballs and pan fry over medium-high heat in a little oil until they are dark brown and have reached an internal temperature of 165 degrees Fahrenheit, about 10 minutes. Soak the rice vermicelli in boiling water until soft, about 3-4 minutes. Drain and rinse with cold water. Saute the mushrooms in a little oil until cooked, about 3-4 minutes. Whisk all the dipping sauce ingredients in a small bowl. Fill a large, shallow bowl with hot tap water. Dip one rice paper wrapper in the water and let it soften for about 30 seconds. Lay the wrapper on a flat surface and top with some rice vermicelli, carrots, cabbage, a stem of cilantro, four meatballs, and a few mushrooms. Pull one end of the wrapper over the fillings. Fold the sides in then roll up like a burrito. Set aside on parchment paper (they will stick to most other surfaces!) and repeat with the remaining wrappers. Are meatballs coming out cold? These are PER-FECT for winter, these rolls look amazing!